To say HBCUs were designed in the spirit of “school choice” is like arguing Black folks must’ve been tired of the humidity, thus The Great Migration was spawned. And DeVos knows that. Her main goal was to further push the privatization of schools. 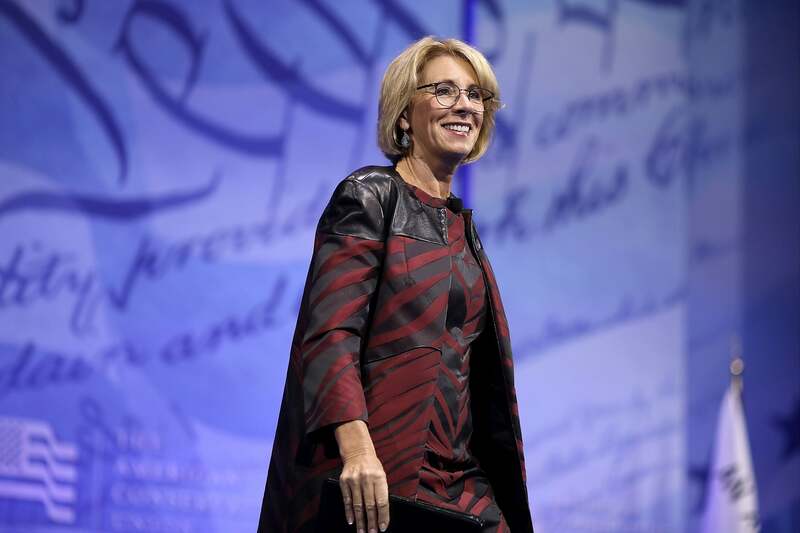 Thanks to this administration and the congressional cowards who enable it, we have a Secretary of Education, someone in which it is not far fetched to wonder whether or not she knows her ABCs, in power. And for a person who belongs to a family that has donated money to mindless activities like gay conversation theory, it is amusing to see Betsy DeVos severely struggle to shape shift into the role of someone actually qualified for the position. Somewhat amusing because in the end, DeVos is the lead character in the horror flick that is the future of public education. DeVos’ gift of gaffe was well documented in both her abysmal confirmation hearings as well as one of the first things that happened after she was confirmed. Yes, bless the hearts of all parties involved, but the Twitter account of the Department of Education misspelled the name of President Minute Maid Mo’s new friend in his head, W.E.B. Du Bois. Not to be outdone, they had yet another misspelling in their tweet professing regret for the previous error. There is a new error from DeVos, only this time it cannot be blamed on too much sauce (caffeine), autocorrect, or for goodness sake, typing so darn fast. “Historically Black Colleges and Universities (HBCUs) have done this since their founding. They started from the fact that there were too many students in America who did not have equal access to education. They saw that the system wasn’t working, that there was an absence of opportunity, so they took it upon themselves to provide the solution. When does Betsy DeVos think the first Black school was founded? Based on the language here, it seems to be around the time Michael Jackson released “The Way You Make Me Feel,” the third single from Bad. While it’s impolite to insult someone’s intelligence by calling them dumb, it’s even ruder to be dumb-dumb-diddy about the history of Black colleges and universities. To say HBCUs were designed in the spirit of “school choice” is like arguing Black folks must’ve been tired of the humidity, thus The Great Migration was spawned. Anyone in charge of the Department of Education ought to know the history of HBCUs and that when it comes to choice, Black people didn’t have one when it came to attending the same universities as their white counterparts. DeVos’ main goal with her new role is to further push privatization of schools. Suffice to say, DeVos is inclined to take every opportunity she can to speak to the virtues of “school choice.” She ought to choose her words more wisely and be more selective about shilling for corporate interest because as a Howard University alumni, along with many other HBCU grads, I will be damned if institutions built around dealing with segregation be repackaged in such tacky, ahistorical, incredibly stupid fashion. DeVos then took to Twitter to continue the damage control. Beyond the gross negligence displayed in that statement, though, consider the work DeVos and her family did in Michigan on behalf of charter schools. The work she did to divert funds away from public schools in favor of underperforming charter schools in that state is not a far cry from the harsh reality many Black schools face as their respective states give far more money to their majority institutions. There is no reason to have much faith in DeVos or this administration to advance Black people and our access to quality education. DeVos will do damage, but in her initial statement, we were reminded how dense she’ll be every step along the way.